Norton App Lock conflates two apps if they happen to have the same name. In my case, I have Google Authenticator and Microsoft Authenticator. They both have the short name "Authenticator" on the phone. If I ask Norton App Lock to lock just the one, it locks both of them. That's merely inconvenient. If I ask Norton App Lock to lock both of them, and I unlock just the one, opting to not "Keep app locked in session", it unlocks both of them. That's a security vulnerability. See the screenshot, where both Authenticators are listed in the Norton App Lock. 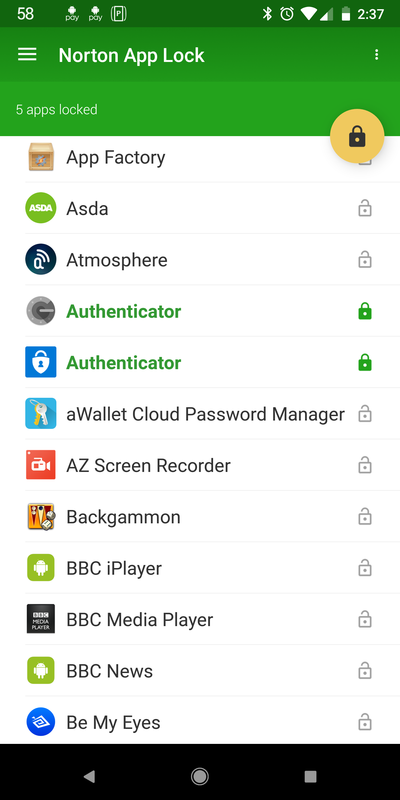 Please would you find a way to identify the specific app being locked in the case where two or more apps with the same name. Interesting find. I'll pass this along to my Norton Contacts.